I’m so excited to have Pam Marshall on the blog today! Pam is a former Authentic Copy student who’s gone on to create an amazing life for herself. Pam swapped her career as a teacher after discovering copywriting on my Authentic Copy course, now she’s successfully built her own children’s clothing line. You simply never know where copywriting can take you! Watch the interview video below, or if you prefer read the transcription. You’ll leave feeling inspired and motivated to take the next step to freelance freedom! Tina: Pam and I have known each other for a long time. I had a program called Authentic Copy that was a live event I did in Tucson some years ago, and Pam was one of my attendees and students. Pam, what were you doing when you came to that event? What had you been doing for work? Pam: I was a teacher. I had been teaching for about fifteen years and found my way to you because I realized that eventually this was not what I wanted to do forever. Even though I loved it, I knew that I wanted to pursue something different. I enjoyed writing, and then I found you, and things took off from there. Tina: The rest is history! So at that event, I taught you three main components. We called it autoresponders, which are the emails, the opt-in (which is when people sign up to get the emails), and the sales letter. 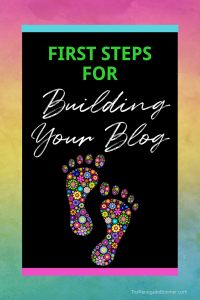 Now you didn’t really have a big marketing foundation or anything before you came to the training with me, right? Pam: No. I knew nothing. I knew nothing. Tina: So you came kind of just charting out your journey. You didn’t have any experience as far as writing for other people or marketing. You had been a teacher for fifteen years, which is a heck of a job, and I’m sure you were an excellent one. But you were just looking for something different. So you went through the training, which was a three-day training. And how did you find that training as far as being able to absorb what I was teaching you and understand what we were going to do with the copy? Pam: Well, being a teacher myself, I found that your teaching style was exactly what I needed — so easy to implement and to make it relatable to things you already experience. I really appreciated your style and the way that you gave as much of yourself as you could, one on one, group, always – I don’t want to say always, but just always accessible. You weren’t always accessible. Pam: You do sleep. But pretty much she was there if you needed her, and I’m sure she still is. She’s still there for me. 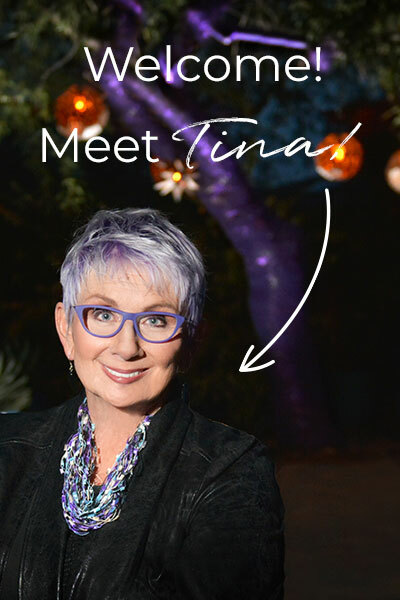 Tina: You were still working as a teacher, and copywriting was kind of like a side hustle at the beginning, right? You were doing it after hours from teaching? Pam: Correct. I would teach during the day and come home and work, in the beginning studying, doing lessons, and eventually working for clients part-time. 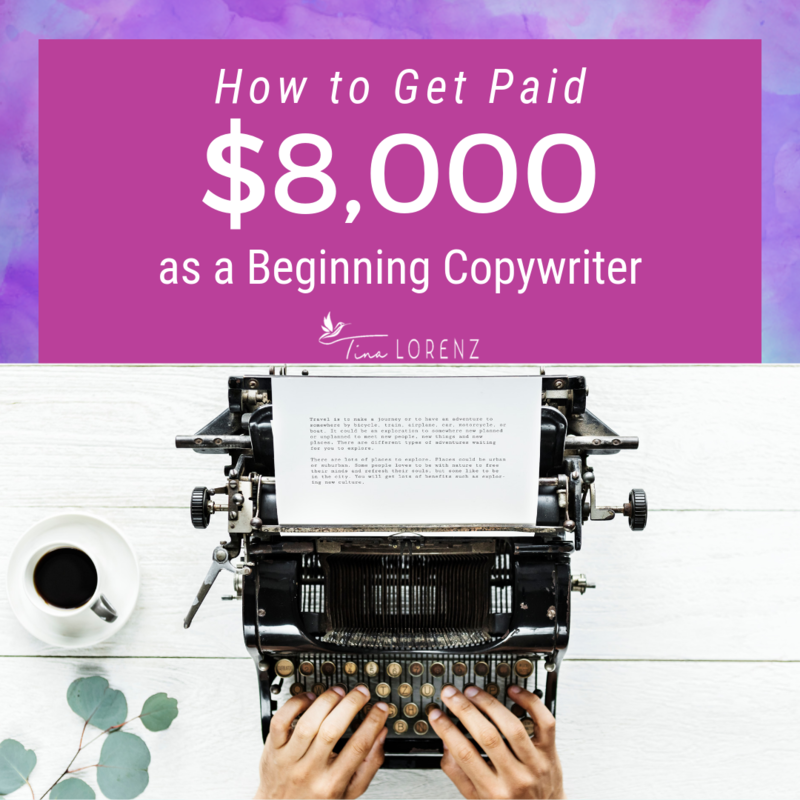 Tina: So I don’t know if it was your very first client, but one of your earlier clients at the beginning of your copywriting journey — I think I remember you telling me you charged something like $750 for the project. Is that right? Pam: Yes, and I was thrilled to get it. Tina: That’s right. I think a lot of people might say, “Yeah, that’s sounding good already because a side job, $750, that can be a car payment.” It might be someone’s mortgage payment or rent, and so it’s very good money. I was stilling speaking with you after the course through a forum, and you were talking to another client. They had that type of project that we discussed with the opt-in, sales letter, and some emails, right? And so I was thinking about this with you, and I said, “Okay, so here’s what I think you need to do for your fees.” And what did I tell you to charge? Pam: You told me to charge $8,000. Tina: And your eyes kind of rolled back in your head for a minute. Tina: Well, and that’s the other thing. So you told him your fee, and he’s asking how to pay you, and so did you get paid in installments? 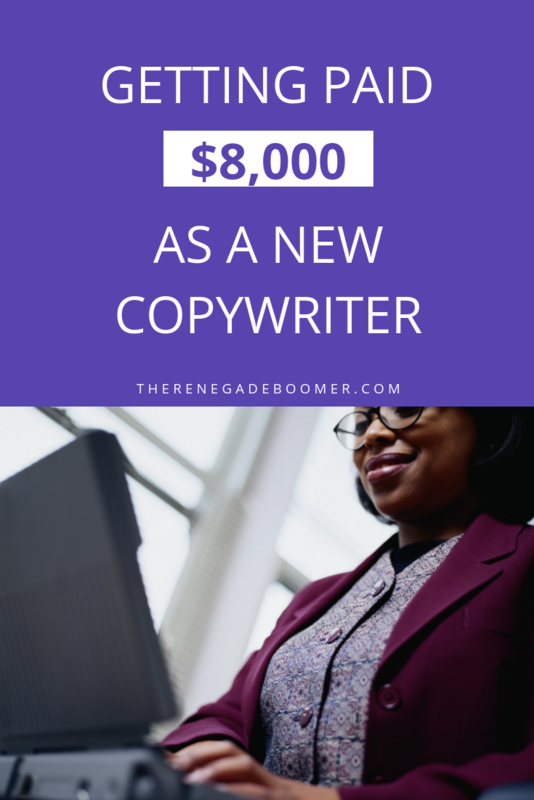 How did you get paid that $8,000 as a beginning copywriter? Pam: No, no, no. I got paid up front. I got the $8,000 in advance, and it was not an issue at all. Tina: Would you have thought of doing that if you hadn’t learned that from me? Would you have thought I could actually say this number and tell him it’s payable in advance before you knew the project? Would you have thought that was possible? Pam: No, no, especially me. I would have tried to work with him every way. But you get what you’re worth up front, and you deliver. That’s what I knew that I had to do to be able to deliver. And even though I knew I had those skills, there was still this little seed of doubt in the back of my mind. Could I really do it? What if I don’t get it done the way I should? And all of those doubts that we all go through, doubting your value and your work, but Tina taught me through that as well. Tina: I think it’s so normal to go through that, especially if you’re used to just getting a regular paycheck or something way less as far as the fee. And speaking of that $8,000, was that a two-or-three-month-long project? How long did it take you to actually deliver the goods on that $8,000 project? Pam: No. 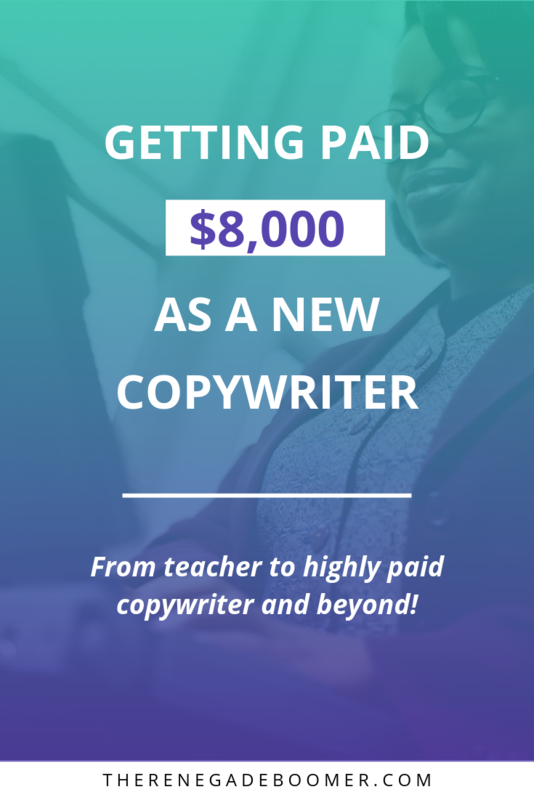 That took about a month to do the autoresponders, the opt-in, and the sales page, and that $8,000 was actually double what my monthly salary as a teacher was at the time. Just amazing! Tina: So we’ve got years of college, all the expenses of college, fifteen years of teaching, and you were still making half of what you got on one project as a copywriter. Tina: Amazing! And the other thing is learning the copywriting and the marketing really have nothing to do with what your degree was in. You had already proven that you could set goals, meet them, and to have a reward at the end, which was your degree and then a job that you’re great at. I’m sure you loved your job and the children loved you. But you just came to a point that you were ready for something else. And that was part of the journey. Then the program called Authentic Copy you came to was three days long. 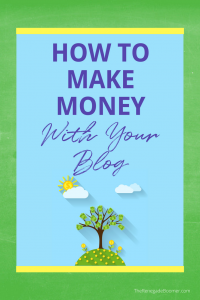 From that training and participating in a forum with me, you were able to take that training, which was way less than a college degree as far as expense, by the way, and you were able to very shortly after get to the point of having an $8,000 project as a beginning copywriter. So I would say that was a pretty good return on your investment? Pam: Oh my goodness, absolutely the best return. And it’s still helping me today, so it has paid for itself a hundred times, so definitely. Tina: What happened with all that nervousness about delivering? Did you overcome it? How was it with the client when you gave them the finished project? How did it go? Pam: He loved it. It was exactly what he wanted and he was just thrilled. He said, “I can’t wait to run this and to see the returns from this,” and then I went on to do a few more smaller jobs for him as well. Tina: So you continued to have other copywriting projects and work with other clients with similar fees or more. One of the reasons to get paid in advance is because what we have are the words and the strategy. That’s the commodity. You can’t go get them back or retract them, and it’s also an abundance thinking that your expectation for yourself is that you will get financially rewarded for your skills. And basically you’re teaching your clients to respect you and honor the way you do business. The initial thought might be that the client won’t do that, but they will — especially if you’re coming at it from a place of integrity (which of course you are!) and making that relationship with them, that connection. That’s also part of the marketing platform of making the connection with who you serve and who their clients are. Tina: So one of the great things that can come out of copywriting is while you’re learning and gaining the confidence, you start to think about what else you can do with your abilities. Sometimes you have other passions or interests. And I like people that are learning copywriting from me to understand that this can also help you achieve other levels of goals you want to meet in your life or passions you want to follow. And as we are seeing with this background, something might have happened for you along those lines. Tell us what happened with your journey from copywriting and marketing into what you’re doing now. Pam: Well, it all started when my first granddaughter was born, and of course I wanted to buy little clothes for her. I saw the most adorable things online that were so unique that I couldn’t find in a store. 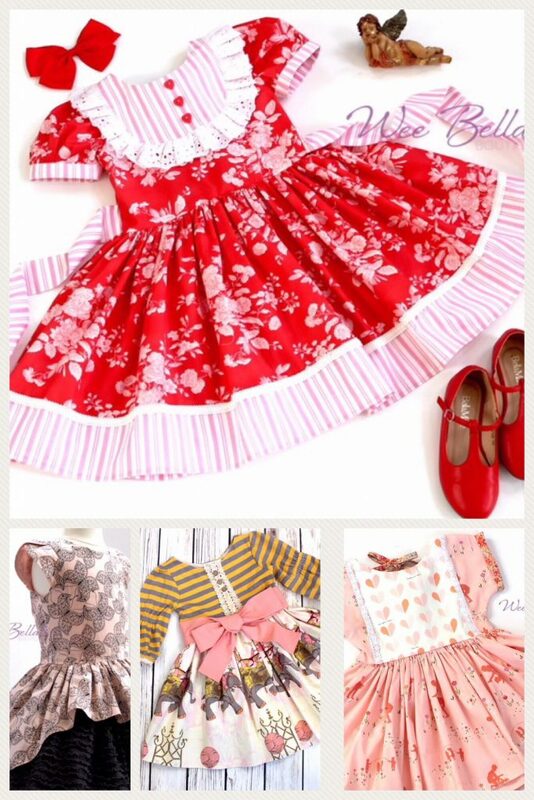 And I said, “Where are these coming from?” And I learned that there’s a boutique world out there for little children, so I started creating and designing my own fashions for little girls, and the name of my business is Wee Bella Boutique. Tina: That’s a good name. Pam: Thank you. It means “little beauties.” I make original designs. Most of them have a vintage look. I might do a few modern things mixed with vintage every now and then, but I knew I had this passion, and when my granddaughter was born, it just exploded. I knew that I had the skills to start another business. Tina: It’s such a great journey for you because you grew the confidence, and then you had the marketing chops and the copywriting ability. What I teach is that copywriting and marketing is a foundation for everything that you might want to do online or entrepreneurial, any kind of business you want to start. It’s great to be able to enjoy what you’re doing, but you also want to make a really good living from it. What do you call your customers? You have a name for your clients. Tina: So how did you get into the vintage look? There’s a certain type of client that’s going to want that. 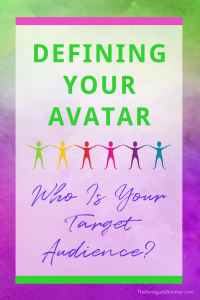 How did you start identifying who your people were, your perfect prospect, your ideal client? Pam: Well, in order to learn more about the business and to see what people were doing with it, obviously I had to get involved. I was looking at these boutique stores that are online, and seeing what the moms had to say about it, and that’s why I started marketing research. Although I didn’t think, “Okay, I’ve got to go do marketing research,” I had a passion for this, and I knew the mamas had a passion for this as well. So I got to know them, and I made a sincere connection with them, and I learned what they liked, what they were looking for, how I could appeal to them, how I could develop my own USP to make them want to come to me rather than go to Macy’s. Tina: Let me just stop you right there because for someone that is new to marketing, they might not know what a USP is. Can you tell us what a USP is? Pam: That’s your unique selling proposition. So that is what makes you different or makes you stand out from the competition. Tina: Exactly. So you actually learn the language, the certain terminology they might use. How has that affected how you describe your garments and how you describe these beautiful dresses when you’re marketing them and you’re going to tell them what they’re getting? What’s the difference between what you might have done in the past before you knew marketing and what you do now after taking Authentic Copy? Pam: Well, when you’re describing a dress, you want a description that is as vivid as possible so that the mama can actually see their little girl wearing this dress and feel the emotions that she would feel when she sees her daughter looking angelic and beautiful. So you want to write a description that lists not only features, but gives more information. In other words, you don’t want to say it has three buttons that button up the back. Well, okay, big deal. But you need to actually describe those buttons. Are they vintage? How does it contribute to the overall feel of the dress? Are they easy on, easy off? If you say they’re Victorian or they’re vintage, that will take you to a whole different level of emotion. Tina: Do you feel like your copywriting and marketing flowed after taking the course? It seems like finding your ideal client became second nature to you. People respond to the way you’re describing what you have for them. Pam: Yes, they do. They will tell me, “Oh, I have this event coming up, and the way you describe this dress, well, this is perfect for it.” You just try. Of course you don’t just list features; you list the benefits. Would this be perfect for a picnic? Yeah. You may not think of that if you’re just putting something out there, but you give them every possible situation. You learn this in copywriting as well. Tina: It’s like telling a story and bringing them with you into that story — where they are now, where they are now in their thinking, or if they want their daughter to look this way or it’s for this special event. And the other thing I wanted to point out, you were not 22 years old when you started this transition from teaching into copywriting. I was past 50 when I even discovered copywriting. I honestly did not know what it was until I was past 50, and so that’s when I began online and it all went from there. And I have been doing this now for – we’ll just say over a decade. 😉 But one of my mantras you probably heard me say is it’s never too late. What would you say to someone who might be mature who’s thinking they’d like to make a change and do something different online and work from home? Pam: This is actually my fourth career. When I started copywriting, I was not a young thing. I had been teaching for fifteen years, and then I moved on a couple of years ago and started this business. And I’m a grandmother. I have seven grandchildren. I cannot imagine not doing what I love to do. It’s never too late. Look at Tina. Tina: But that’s the beauty of it! With copywriting, it doesn’t matter where you live, doesn’t matter how old you are, how young you are. You could be 23 and wanting to do this. It doesn’t matter what your past experience is. You don’t have to have a degree. You don’t have to have special training. You can learn enough to begin, and because one of the things that I teach is that most of the time the clients that you’re dealing with don’t know the things you already know. And you already know more than you think you do when you go through this kind of training, and you’re staying three steps ahead of the people you’re serving. 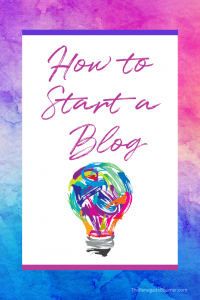 You can get enough knowledge of the opt-in, the sales letter, and the emails to be able to start doing copywriting projects and serve them in a way that they don’t know how to do. They don’t know how to think the strategy through or how that copy should be written. They need someone else like you to do it. And so did you find this to be the case, that you could come into a project with someone, and you already knew more than they might know about how to do this online, what their message needed to be? Pam: Exactly, and that was part of the beauty of it. You learn these basic skills, and you are already ahead of the game as far as where they are and getting this done for themselves. They think you’re magic because they don’t know how to do any of this. And I think that’s part of the mindset where understanding your worth and your value and what you’re bringing to them because you know more than they do. Tina: That brings to mind one thing I want to be sure to emphasize: you don’t have to know any of the technology. You don’t build a website. You don’t do the design. You don’t figure out how those emails are getting sent. You can make recommendations, but as a copywriter, you are in charge of the strategy and the copy, the actual writing of the words. 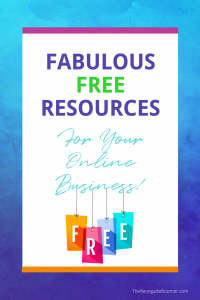 It’s not up to you to do any of those other things, so you don’t have to have any special technical skills other than receive email or write a Word document — that’s about how extensive the technical skills are with this. And did you find that to be the case? Pam: Yes, that was the case. I already had a desktop and a laptop, and so I had everything I needed. I knew how to send an email, and that’s all I did. Tina: You need the internet. You need a computer and a cell phone. I like using a printer. That’s basically it! I want to really emphasize for anybody thinking about this when we’re talking about these email sequences, you don’t do any of that technical work. You’re basically delivering everything as Word documents to your client, and it’s up to them to get the design done. It really is only writing the words, and you don’t have to have a degree to do it. I’ve been on my own since I was 17. I have no college degree, didn’t know what copywriting was until I was past 50, so it’s never too late, and also never too early. Maybe you’re just out of college and you’re wondering what you’re going to do. Perfect! 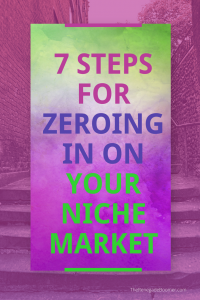 There are many different targets and different markets, and you could market to fellow millennials in their 20s or 30s. There’s a niche and a place for everyone that might be interested in doing this if they put the effort into it. Tina: So Wee Bella Boutique. They can find you on Facebook, correct? Tina: And I do have a new version of the course, Authentic Copy 2.0. Only now you don’t have to come all the way to Tucson. 😉 It’s all online and available 24/7. Pam is a former teacher and someone who’s been through this process and now has this beautiful business. What would you say to anyone thinking they want to try working from home and giving Authentic Copy a shot? What would you say to them? Pam: I would say that you can definitely do this. Tina, as a former teacher, I really appreciate Tina’s teaching style. She puts everything into very manageable chunks. Even if you’ve never had any kind of background in this, everyone has been a customer. Everyone has read an advertisement. It will very quickly become something that you can wrap your head around, and Tina is so kind and so intelligent and so there for you and funny. You’ll have a good time. Pam: And she cares. She has a heart for this, and she has a heart for the people who she is trying to guide along, and I mean that with all sincerity. Pam: I urge you to do this. This will open so many doors for you that you didn’t even know you wanted to be opened. Tina: I totally agree with that. You just never know where it’s going to take you. It’s like this exciting adventure that you can move on with your life and find out there’s even other things that come after that. You just never know what doors are going to open to you when you do this. But I just want to thank you so much, Pam. I’m so proud of you and Wee Bella Boutique, and I so appreciate you taking the time to meet with us today, and I just wish you all massive success. 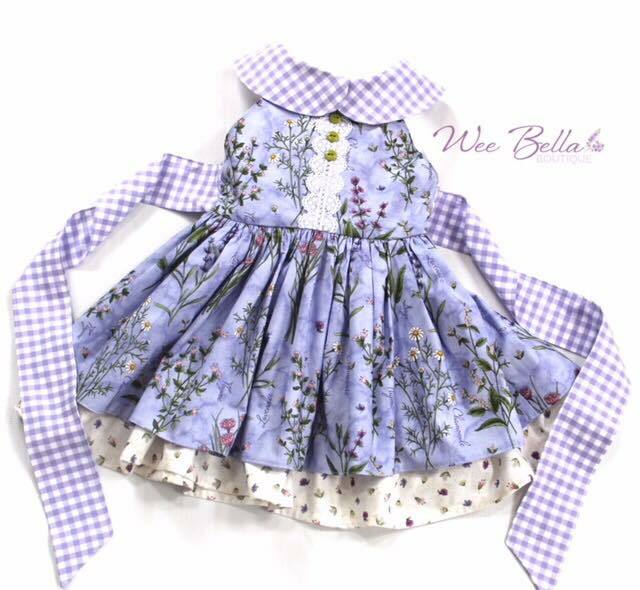 Anybody out there who’s got little girls in their lives especially, you can find Pam through Facebook at Wee Bella Boutique. Thanks again, Pam!